These silver cufflinks are ideal for the scientist in your life. Inspired by the hit American TV series Breaking Bad, the motif portrays periodic table elements which spell the word wine when combined. 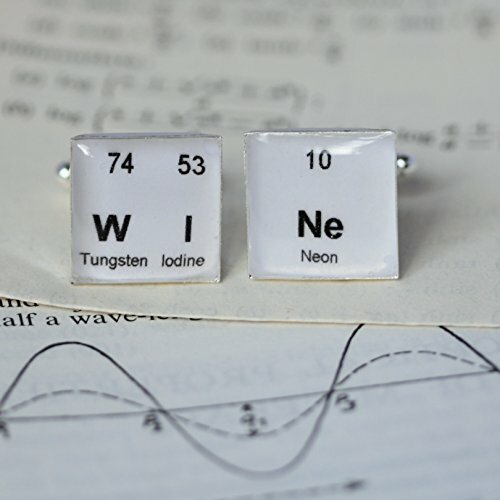 An ideal gift for the wine lover, scientist or the person who is both! The motif is sealed in clear polished glass like resin which is layered by hand to produce a domed effect which enhances the 3D look of the cufflinks. The cufflinks are available in a silver plated or antiqued bronze setting and come in a smart dark grey cardboard cufflink box. If you have any questions about this product by Sophie Hutchinson Designs, contact us by completing and submitting the form below. If you are looking for a specif part number, please include it with your message.